A gentleman’s study is another room in the house that has gone by the wayside. If you remember those older films that depict the earlier half of the 20th century you should remember that after dinner the gentlemen would retire to the study for an drink and smoke with his guests while the women would retire to the sewing room or drawing room or tea room. 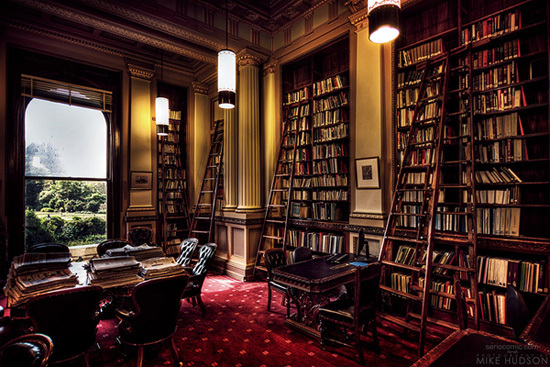 The study is also depicted as the reading room where the man would don his smoking jacket, enjoy a great novel or the daily newspaper, and smoke his pipe or cigar in after a hard days work. This notion of having a separate room that is for the men actually came from the Victorian era. There were many of these gender specific rooms like the male study, smoking room, or the trophy room. Where as women had the drawing rooms, tea-rooms, or sewing rooms. It was understood that men and women did have separate hobbies and passions and it allowed them space while being under the same roof. The unfortunate decline of these type of separate rooms came about after WWII as these spaces were traded for family rooms and visions of the typical nuclear family were promoted. It’s time to bring back the study. Do you have a guest room in your house? Or a place where you let your friends sleep? In today’s 3-4 bedroom house its fairly typical to have a spare bedroom used for a guest room. Take this room back, sure it can still be a guest room, but utilize those unique space saving ideas from places like Ikea ,who offer cost efficient options and turn the bedroom into a manly study where your guests can stay, but they’ll remember they are staying in style in a manly study. Accents like a bear-skin rug, rich leather chairs are simple ways to man-up the room. Install an ion-air cleaner and/or HEPA air cleaners to keep that smoke smell at bay. 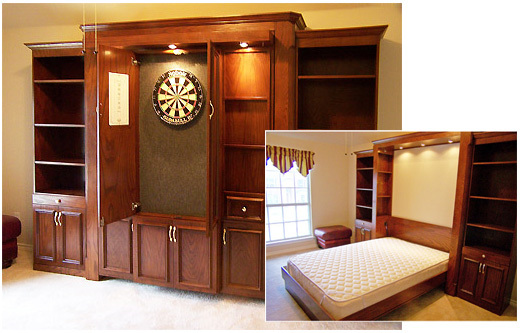 For a bed, forget those traditional beds, why not opt to use the space for reading when no one is in the room and install a Murphy Bed into the wall. The one pictured above is excellent as you get plenty of shelving for your books, and even have a spot to play some darts, not only that you can see where lighting has been added in the shelving unit. Study’s are often rich in darker, warmer, colors like rich browns, dark reds, or rustic colors. So a simple task would be to run up to your local hardware store and pick out a good paint and change the bland base white in the room that most modern houses have to a nice darker color. Now to offset the room, from these rich colors, its important that you utilize appropriate lighting. An overhead fan with a light just won’t cut it. You need lighting installed into book shelves, reading lamps next to your chairs, and most importantly, forget those CFL new fangled lights, you need incandescent lights for that rich yellow glow. Stocking your study with appropriate reading choices is also important. Ensure your study has all of the classics, and modern manly books like the Jason Borne Series or Ian Flemings books and short stories. Throw in Jules Vern’s 20,000 leagues under the sea, and some Earnest Hemingway and you’re all set. Lastly, with this new improvement in your home, take time to enjoy it. So often we allow our busy lives of multi-tasking, reality tv, and social media to keep us from enjoying the simple things in life like quiet time. Unplugging from everything and just relaxing without distractions is very important and many times you don’t even know how much you need some peace and quiet until you actually unplug. So set some time aside, one a day, or a couple times a week when you make use of your study without distractions, light up a good cigar, and crack a good book. Cheers.